Chelsea winger Willian has revealed his own version of his broken relationship with former manager Antonio Conte. The 29-year-old displayed his strained relationship when he posted an edited image blocking of Conte in a team photo after the FA Cup triumph. This culminated in reports suggesting that the winger was on his way from the Stamford Bridge outfit. Willian speaking to ESPN Brazil said that Conte was a difficult manager to work with. He also explained that some of the Italian tactician coaching substitutions were surprising and hard to understand. “I hope he’s not the same as Conte!” he told ESPN Brasil. “I’m joking. I think Conte was, for me particularly, a manager that was difficult to work with. “I’ve had some games that you don’t understand, you’re playing very well and are taken out, you don’t understand. Willian has been the subject of a bid from United with English news outlets claiming that the attacker was keen on reuniting with former manager Jose Mourinho. with just two days left in the transfer window, all indications suggest that Willian would remain as a Chelsea player. Chelsea new manager Maurizio Sarri has spoken to the Brazillian international after his delayed return to Pre-season. The Brazillian reportedly failed to return early from holiday’s but apparently blamed it on passport issues. 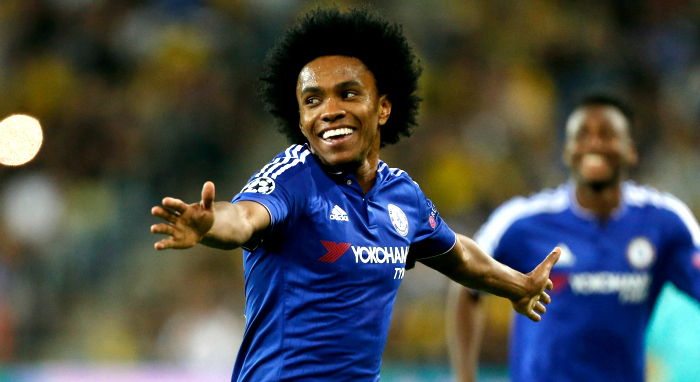 Willian has been with Chelsea for 5 seasons after moving from Russian side Anzhi Makhachkala in 2013. He has won two premier league titles during his time with the Blues and was voted the clubs players player of the year.